We create Alaskan fishing trips that are unrivaled and unforgettable. 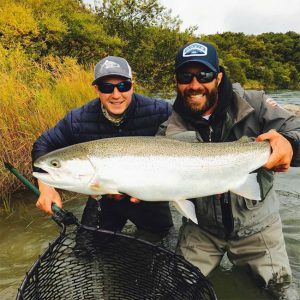 The Alaskan Sportsman’s Lodge and its sister location, The Alaskan Sportsman’s Bear Trail Lodge, are located on unbeatable rivers, offer unbeatable services, and create unbeatable amounts of fishing opportunities. Imagine what the most amazing Alaskan fishing trips might be like, and then imagine them to be 10 times better; that is what Alaskan Sportsman’s Lodges has to offer. Our guests enjoy the most successful fishing ventures and benefit from the endless expertise of our world-class fishing guides. Our luxury services and lodges can put together unique Alaskan fishing trips that are tailored to the specific preferences and interests of each guest. Are you interested in several types of Alaskan fishing trips? Can’t decide between a fly-fishing trip and a conventional fishing trip? Or maybe you are unable to choose between a fly-out trip and a ‘home water’ trip? You no longer have to struggle with this decision: Alaskan Sportsman’s Lodges offers all of these plus more! We allow our guests to pick and choose from a’ la carte menu of fishing experiences every day. Our ‘home waters’ are just as fabulous and fish-filled as any fly-out destination would be. We have knowledgeable guides that know everything there is to know about all types of fishing imaginable. The Alaskan Sportsman’s Lodge is located along the rushing fresh-water Kvichak River. This river is world-class and known as Alaska’s only designated ‘Rainbow Trout’ trophy area. Our guests get the chance to enjoy its rustic beauty and its sparkling waters while in the lap of luxury. This lodge is no ordinary fishing lodge; it is a towering cedar piece of art. This 3,500 square foot giant mountain chalet rises spectacularly from the banks of the rushing and tumbling Kvichak River. Its multi-storied windows look out across the rugged, wild, and beautiful terrain of the Katmai National Park and Preserve. Beyond our luxurious lodging, our guests enjoy the best fishing available in the Bristol Bay region. The Alaskan Sportsman’s Bear Trail Lodge is just as amazing as its sister lodge. This towering building of luxury has its foundation on the bank of the infamous Naknek River. This river is home to all 5 species of salmon and Rainbow Trout. We offer fly-out missions but, unlike other fishing lodges, they are not mandatory. This is because we know that the waters that flow right in front of the lodge are just as great as the waters in the Alaskan wilds of our backyard.